NFL scouts are starting to figure out what Big East left offensive tackles have known for a few years which is that Trevardo Williams is one dynamic athlete. I thought UConn's all-time sacks leader might be somewhat limited in the running and agility drills today at the NFL combine due to the ankle injury he suffered during a Senior Bowl practice. My bad. 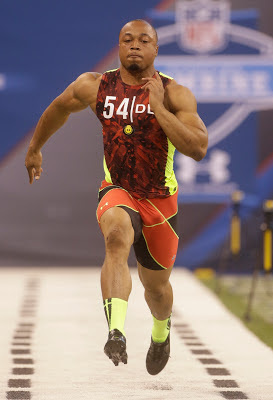 Williams has already posted the top mark for defensive linemen in the 40-yard dash with a 4.57 and also was No. 1 at his position with a 38-inch vertical leap. He also placed third in the broad jump with a distance of 10-4. Williams also benched 225 pounds a total of 30 times which was the fifth best among the defensive linemen.